The New Balance Fresh Foam Beacons is a comfortable running shoe, said some users. The shoe delivered a fantastic ride that was consistent throughout a marathon, commended a runner. According to some reviews, the Beacon provided plenty of cushioning that was perfect for long-distance pavement runs. Several users agreed that the Fresh Foam Beacon was a lightweight running shoe. The midsole provided adequate arch support, stated a runner. Another remarked that is was responsive and firm enough to supply speed. One customer wrote that the upper was flexible. A couple of runners admired the colors of the Fresh Foam Beacon. This running shoe has a reasonable price. The sizing of the New Balance Beacon was too small, according to a few wearers. A few runners were disappointed because of the shoe's narrow forefoot. Some users are disappointed because the insole keeps on sliding around. 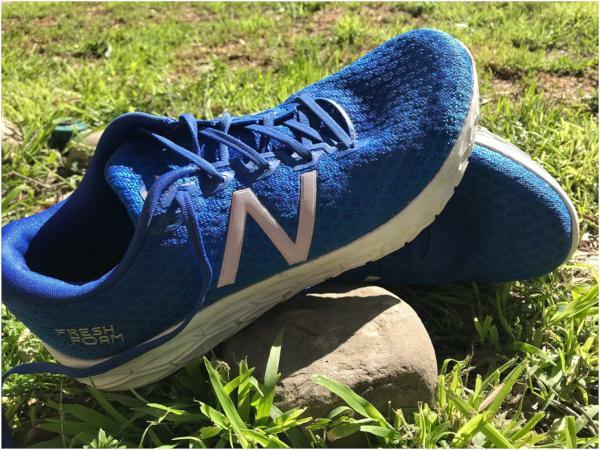 For the majority of its users, the New Balance Fresh Foam Beacon delivered the perfect balance of cushion, lightness, and snappiness. Many were very impressed with its performance and thought there was little to none about the shoe that was worth criticizing. Overall, the Fresh Foam Beacon was a shoe that many considered as highly recommended to anyone looking for reliable running gear. According to Da Vinci, “simplicity is the ultimate sophistication,” and if that’s true, then the New Balance Fresh Foam Beacon is an incredibly sophisticated shoe. I’m sure that plenty of research and development has gone into the production of the Beacon, but the result is a simple, light, well-priced shoe that provides everything that I could ask of a road shoe: cushioning and comfort through long runs and responsiveness at faster paces. In recent months, I’ve run a lot of miles in a New Balance Fresh Foam shoes, with mixed results. The Fresh Foam Zante is my road shoe for every occasion and has been my go-to shoe for fast running and races - everything from 5k to marathon. By comparison, the 1080 v8 was reliable and durable but not particularly exciting. And despite being a road shoe, I’ve relegated it to runs on light trails. The Fresh Foam Beacon promised to be every bit as exciting and responsive as the Zante while providing a little more cushioning underfoot, and an even lighter build. All this with a price tag of £90 amongst a range of running shoes priced at £120-150. With a marathon coming up, I was really looking forward to trying this one out. New Balance offers the men’s Fresh Foam Beacon in three colorways: essentially black, petrol and electric blue. It may not be a huge choice, but I really liked the petrol (with a hint of “flame” on the inside of the tongue and the rubber outsole). It’s a great looking shoe which essentially comprises of a very simple knitted mesh upper glued onto a slab of New Balance’s new Ground Contact Foam. The upper feels extremely soft, with minimal overlays — almost the antithesis of some of today’s seemingly over-engineered shoes such as the 1080v8. I was pleased to see that the “N” logo (the only overlay used) is very reflective – ideal for me as we approach winter and much of my running will be on dark, narrow country lanes in North Wales. Visually, what strikes you most about the shoe when you first pick it up is the exposed foam midsole/outsole with its contrasting colored lugs. This is one area in which the simple construction really shows. 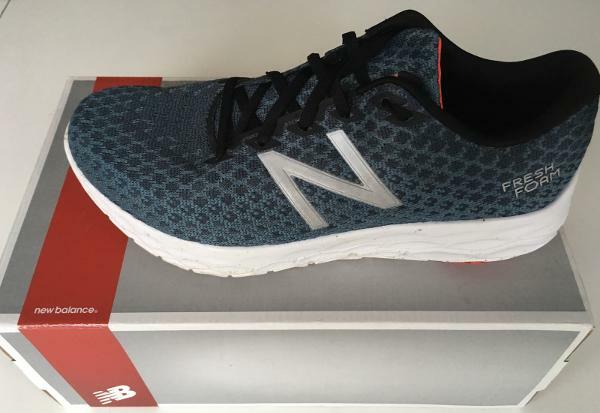 The Fresh Foam Beacon is listed as 213g (7.5oz), which despite all the cushioning provided is pretty close to the weight of New Balance’s 1400v6 racing shoe at 204g, and save a good chunk of weight off the Fresh Foam Zante v4 at 244g (8.6 oz). As expected, my UK 13.5 (US14) shoe weighed in heavier than the standard shoe, at 267g, but the lightest shoe I have run in. What is always more important than the numbers are how light the Beacon feels on the foot. It is barely noticeable when running despite the big chunk of foam underfoot that cushions every footfall. Even towards the end of a marathon when everything else was hurting, the shoe still felt exceptionally light, and my footfalls didn’t feel as heavy as they often do when the finish line refuses to get any closer. As with all New Balance shoes, I find that I need a ½ size larger (in UK size) than my normal size. The shoe then fit comfortably right out of the box. In this case, I wear a UK 13.5 (US 14) which is the same size I’ve used in all other New Balance shoes, Hokas, and Salomon Trail. For comparison, I generally use a UK13 in Brooks, Inov-8, and Asics, though the last two can feel a little snug. US readers, please note that despite the variation in sizing across manufacturers, I almost always require a US 14/EU 49. It’s quite possible that the differences in sizes, therefore, are due to conversions from US to UK sizing. The foot slides into the shoe and feels comfortable right from the start. The upper is so simple that there isn’t anything for the foot to dislike. Just lace them up to your preference and hit the road. My very first run in these shoes was a 16-mile marathon training run (at marathon pace), and I did exactly that; slipped on the shoe, laced it up and ran with no need to stop and adjust the shoe or lacing at any point. Despite the simple upper, the foot seems well held throughout on either long runs or faster interval sessions. 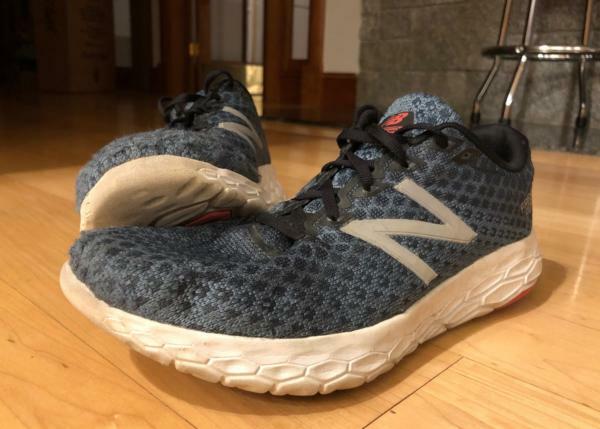 The toe box is also a little narrower than other New Balance shoes in which I’ve run to the extent that I experienced a mild flare-up of Morton’s Neuroma after each of the first few runs. The shoe did, however, seem to give a little in the toe box with use, and it was no longer an issue after the first 30 miles with the shoe. I’m still not entirely sure what type of mesh forms the upper. It feels more akin to fabric than an engineered mesh. It has very little elasticity which helps to maintain a comfortable fit around the foot once you’ve laced up and has a soft, comfortable feel which is at odds with most mesh uppers used elsewhere. Despite this, it is a very breathable upper, and effectively wicks away moisture, seemingly managing to exhibit the attributes of both engineered mesh and fabric. Around the forefoot, the upper is comprised of a single layer of mesh, strengthened a little around the toe cap with a thin layer of foam. Moving further back, the midfoot incorporates a bootie which holds the tongue in place, and which plays a part in wrapping the foot comfortably and securely. This is further supported by the only significant overlays, in the form of the “N” logo, and which are positioned to provide an element of support to the midfoot further. The tongue is well cushioned, and is similar in feel and cushioning to the Zante v4. The lace holes are formed using a thin, flexible overlay for each hole. This is also used to provide a little detail around the laced section. The cushioning around the ankle and heel is more than sufficient to hold the heel comfortably. 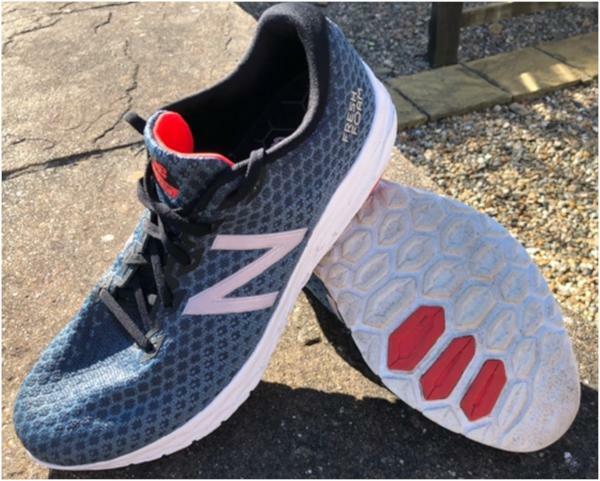 If anything, the Beacon offers slightly more cushioning here than the Zante v4, with the cushioning extending a little further down towards the sole. The heel cup doesn’t have the hard, plasticky feel that other shoes can exhibit, but feels as if the knit upper has been strengthened just enough to hold the heel in firmly, but comfortably. The Fresh Foam Beacon is very much a neutral shoe while the simple knitted upper wraps the footwell. There is a minimal amount of support provided, and I’d suggest that it is therefore only suitable for runners who want a truly neutral shoe. The midsole of the Beacon is formed of a single slab of New Balance’s “Ground Contact” Fresh Foam. The Ground Contact Fresh Foam is designed to be more durable than other versions while retaining cushioning. This eliminates the need for anything other than a very minimal element of a rubber outsole (more of that below). The heel drop of 6mm is similar to the Fresh Foam Zante. So essentially, the Beacon has a very light and generous slice of foam glued onto a simple upper, with a few rubber lugs to limit wear on key areas of the sole. I hear echoes of the “keep it simple, stupid” mantra again. There is, of course, a little more to it as with other Fresh Foam shoes, there are hexagonal patterns along the sides of the midsole. The concave hexagons on the outside allow the foam to compress more, providing greater cushioning, while the convex shapes on the inside cause the foam to compress less, offering greater support. So how does it feel? In my experience, New Balance Fresh Foam seems to have the ability to change character depending upon the costume it wears. In the 1080v8, it cushions reasonably well but plays a dull, unresponsive role in the running experience. In the Zante, it provides an impressive balance of cushioning and responsiveness. It may feel a little stiff to some, but I love the shoe, and a bit more cushion underfoot. In the midsole of the Beacon, the Fresh Foam gives its best performance yet. It provides a level of cushioning consistent with a Hoka or a Brooks Ghost, delivering the flexibility and responsiveness required for tempo sessions and intervals in a package that could compete with a racing flat regarding weight. New Balance development of their Ground Contact Fresh Foam has allowed them to join Adidas and Nike in presenting their “exposed foam” running shoe. In the case of the Beacon, the largely exposed foam sole is reinforced by 5 single rubber lugs located in the areas of highest wear: the heel and toe off. The lugs are thick and durable, but also feel soft and cushioned to the touch. There’s little more to say about the outsole, but in the case of the Beacon, what’s more, important is what is not there. I’m sure that it’s the absence of a full length blown rubber outsole in this shoe that allows the Fresh Foam to deliver its superior mix of cushioning, responsiveness and flexibility. I’m sure that this is going to be a real concern for anyone considering the purchase of the Fresh Foam Beacon. I cannot honestly say how many miles I’ll get out of my Beacons. All I can do is report on my experience so far. At the time these pictures were taken, I’d run approximately 70 miles in the shoe, including a full marathon race (I’m an 87kg/190lbs heel striker), and to be honest, there is very little wear showing to date. The lateral lug on the heel, as expected, shows the most wear (as shown below), whilst the rubber lugs at the front still show the light pattern which is part of the design. Most importantly, the foam itself is barely worn other than a little sign of wear right at the front of the shoe from taking off. I will be wearing these shoes for a variety of runs in the weeks ahead and will update this review with my experience as I clock up the miles. I would be surprised however if the shoe did not last to around at least 400km and longer for lighter runners. I feel that these shoes would not stand up well on hard packed or gravel trails. Running shoes are highly personal, and so my experience of shoe performance should always be balanced against my own characteristics. I can’t speak for the front of a pack runner, but hope my views will be useful for both club runners and newer runners, as well as those on the heavier side. To put my running in perspective, at the time of writing, I’m 47, about 6’2”, around 87kg (190lbs), running 50-60 miles pw. I tested the Beacons in a marathon race run in 3:13, and a recent Parkrun clocked me just under 19’ for the 5k. You may have already guessed that I really liked these shoes. I’d hoped that they arrive in time for me to use them in the Chester Marathon, and they turned up on the day before my last long run. As mentioned above, I put them on and set off. At that point in my marathon training cycle, there’s a lot of fatigue built up over some high mileage training weeks, and I was ready to ease off before the race. I’m sure you’ll appreciate the appeal of a highly cushioned, but light pair of shoes. The Beacons didn’t disappoint. That first session involved one hour out, just a little outside marathon pace, followed by a faster return at sub-marathon pace. The cushioning was unbelievable in such a light shoe, and yet somehow I didn’t feel disconnected from the road, perhaps because of the lack of a traditional rubber outsole. During the return leg, I felt fresher than I had any right to after an hour running and came back well inside my marathon pace. Over the last couple of years, my marathon training cycle has incorporated the Brooks Ghost for longer slower runs, and the Fresh Foam Zante for faster intervals and marathon paced runs. For those last few weeks, the Beacons replaced the Zante v4 for faster, and marathon paced sessions. To cut a long story short, the Beacons did a great job for my marathon. They offered everything that the Zante had previously done, but the additional cushioning was very welcome in the later stages of the race, reducing fatigue caused by the pounding of the feet on the road for 26 miles. So far so good, but how about faster sessions? This is where the Beacon really surprised me. It came alive for me when the speed increased. Just two days after the marathon I slipped them on for a recovery run, and feeling good after a couple of miles, decided to try some faster intervals. Even on tired legs, I found it easy to ramp up to 5k pace and faster for half a dozen stretches. The response was far better than I expected from the chunk of foam that makes up the midsole, and the transitions from landing to take off were impressively fast. Even at faster speeds, the Ground Contact Fresh Foam is effective at reducing the impact of each footfall to the extent that I felt surprisingly light on my feet in a way that I haven’t with other shoes. All this without feeling as if I’d lost contact with the ground. Just a quick note about the sock liner, as this has been an issue in the last Zante v4 in which I eventually resorted to gluing down the liner to prevent it folding up underfoot during wet weather. The Beacon seems to use the same sock liner as the Zante v3 which performed well and in which I didn’t experience any movement. For a brief moment at 8 miles in the marathon, I felt the front of the liner fold a little under my toes, but it moved back of its own accord after a mile or two, and I didn’t have any further movement. But I needed to be sure, so I deliberately took the Beacons out in the worst weather we’ve had for several months, and ensured the shoes were thoroughly wet by running through a ford. A long ascent, and short, fast windy descent later I can confirm that the liner did not move at all in the shoe. At its heart, running is an incredibly simple activity. In an era of technology and over-engineered shoes, the simplicity of the Fresh Foam Beacon provides a real breath of fresh air and makes it a real joy to run in. In my opinion, Fresh Foam performs flawlessly in its Ground Contact guise. It offers a level of cushioning that can take you through a marathon while allowing you to turn up the pace for a faster interval session. It offers a level of cushioning comparable to Brooks Ghost with the flexibility and responsiveness of a Zante that will deliver for those faster sessions, all in a package that could compete with a racing flat in terms of weight. Up until now, the Zante has been my “all-around shoe of choice”. Now the Beacon and the Zante are very different shoes, but for me, they both fulfill a very similar role; that of a real all-around running shoe that can “turn on” to a faster pace as well as grind out the longer miles. So whilst my hand may hover momentarily between the two shoes, the lightness and additional cushioning will now see me reach for the Beacon in preference to the Zante. The New Balance Beacon is a highly cushioned shoe utilising a ‘new’ variant of the proprietary Fresh Foam midsole known as GC (ground contact). Up until now, most with Fresh Foam shoes have left me and others rather nonplussed. Lacking responsiveness in contrast to the excellent but firmer Rev-lite midsole, this shoe changes things. Out of the box, they look great. The midsole is thick but not quite as big as it appears in online pictures. The first thing that strikes you is how light these shoes are: my UK size 9 weighs in at 218g, and they feel just as light on your feet. The ample stack height has a heel to toe drop of 6mm. The upper is an engineered mesh that looks good, I usually prefer an ‘old school’ look, but the pattern in the ‘Petrol’ colourway almost resembles fish scales. The lacing is exceptionally comfortable, this is an area I often struggle with given a high cuneiform bone, but the tongue and laces sit perfectly without too much pressure on the top of the foot. The laces are flat, a little stretchy and don’t need much adjustment at all, they are a real lace up and go shoe. Typical for New Balance they fit on the smaller side, I went half a size up, and that fitted comfortably. The midsole is thick Fresh Foam GC; there is virtually no outsole, just a few strategically placed pieces of rubber and the heel and forefoot, reminiscent of the Nike Free 4.0. Images below show Beacon on the left and Nike Free 4.0 on the right. Traction and grip is surprisingly good, and similarly, the expanse of exposed foam doesn’t seem to be showing any wear after 50km. Despite the previous superlatives, the best part of these shoes is the ride. Normally I prefer a firmer midsole, but every so often it’s good to pamper your feet. The Beacon gives a cushioned soft ride, you can feel the foam compressing gently, but the fantastic thing is it springs right back rebounding the energy to your legs. It’s not bouncy like Adidas Boost or squishy like Lunarlon, but just right. It feels great to walk on, but as you pick up the pace slowly, it comes to the fore, even at medium to faster paces it is very responsive. The heel has a bit of a slant, and the sole is rocker shaped but very flexible in all planes, it encourages a midfoot landing and a quick transition to toe off. The closest shoe I’ve run in is Skechers GOrun Ride 7, the Beacon, however, feels more stable, in part due to a better structured upper. Stability comes from the overlays in the upper; the arch support is reasonably low. I’d recommend the Beacon for longer mileage and recovery runs, and although I know some people who also rate it for speed work I prefer something with more ground feel. Occasionally you come across a shoe that is a real treat to wear; the Beacon is that and more. I was trying out the New Balance Vongo immediately after running in the Beacon, and it felt like running with my feet in massive blocks of polystyrene. This isn’t perhaps a fair comparison as the Vango is a stability shoe nonetheless it emphasized how light and fun it was to run in the Beacon. For me, this shoe is a steal even at the MRP, given that it can often be found cheaper online it’s a no-brainer. New Balance Fresh Foam Beacon: A beacon of light for this runner! I have run thousands of miles to date. I have also worn numerous brands and styles of running shoes. I have shoes for speed work and intervals, shoes for easy days and shoes for long runs. A friend of mine suggested the Beacons - he raved about them. To be honest, with the millions upon millions of reviews out there, for every type of product that sculpts and control our lives, I’m a bit cautious when I hear or read someone’s reviews because, well, not everyone will have the same experience. After all, everyone’s feet and body types vary, and we all rack up mileage differently. So when he told me about the NB Fresh Foam Beacon’s, I decided to give them a go, with just a tad bit of uncertainty. I’m on my third pair, and I gotta tell you, they are amazing! Best shoe I have worn in years! For starters, they are a great looking shoe. Sleek, stylish and not overly funky looking like many shoes out there that just have way too much going on and resembling a sweater your grandmother would crochet. The colors offered are limited, but clean and sharp. I started out with the “Petrol/Flame” and ended up buying the “Electric Blue” for my next two pairs. Great, vibrant color. Very appealing and match with anything you wear. Wow, are they comfortable right out of the box! I did not even need to break these bad boys in like you have to do with many shoes. For such an incredibly light shoe, they have plenty of cushioning, made possible by the “Fresh Foam” midsole. The outsole has plenty of traction as well, better than any other lightweight shoes. The upper is a knit mesh that offers breathability and a very comfortable fit — no issues with blister or rubbing of any kind. I generally switch out my shoes after 400-500 miles, depending on the type of shoes of course. This shoe outlasts many other lightweight shoes and does not seem to wear down as quickly. The outsole is pretty tough and is made with Ground Contact EVA offering extra traction. They use Blown Rubber in strategically placed areas on the forefoot and medial heel to provide durability in areas that normally have high wear and the modular geometric design adds to the great traction. This is an extremely versatile shoe that can be used for speed work and your long runs! Yes, it's an all-around great shoe for any type of workout - from fast, slow and easy. I have used these for my fast interval training workouts as well as my marathon racing. I even chose this shoe to run my 50 miles in, and let me tell you, my feet did not hurt afterward, nor did I get blisters - comfort all the way. It’s my go-to shoe when I just want a comfortable ride. The New Balance Fresh Foam Beacon is a versatile, lightweight shoe that can be used for fast and furious interval training as well as slow and easy long runs. It’s incredibly comfortable in the midsole, outsole and upper. I’m 5’9” and weigh 165 lbs. I’m lean with muscle, but not like a Kenyan (if only). I have a normal arch and have normal pronation, my heel strikes the ground first and my foot "rolls" inward. They may not be suitable for everyone, but these shoes are great for me. I would suggest giving them a test run at your local running store or buying them online from a company that has a 30-90 day return policy, where, if you don’t like them, you can return them or exchange them for another pair. That being said, I would recommend this shoe to anyone wanting a great running experience, from newbies to seasoned runners. The New balance Beacon is a shoe no one was expecting from. The Zante was positioned as an affordable everyday trainer, and the 1080v6 as a soft recovery shoe, as well as the excellent rc1400 as a speed shoe. With the reveal of the Fresh Foam Beacon, New Balance created a highly versatile, lightweight, and well-designed shoe, all for the affordable price of $120. The Beacon is comprised of a simple knit upper, a thick slab of the new Fresh Foam Ground contact material and a few patches of a minimal outsole. The Beacon quickly became my go-to everyday trainer, and also saw significant use for longer workouts on the road. Recently, New Balance has focused more on updating existing running shoes and expanding their lifestyle line, rarely focusing on developing an entirely new shoe. The original Zante quickly became a fan favorite, but previous generations lacked the softness and ride of the original. The Beacon manages to mimic some of the Zante’s amazing original features while still adding more cushion and reducing weight. In many ways, the Beacon feels like New Balance’s take on Hoka’s Clifton 1. While it lacks Hoka’s meta-rockered design, it has a simpler, more modern knit upper, and a slightly snappier feel. The Beacon also sports one of the best cushions to weight ratios on the market, boasting 26mm and 20mm of stack height in the heel and forefoot respectively, while only weighing in at 7.5 oz. The New Balance Beacon keeps it simple with a one-piece knit upper featuring minimal overlays and structure. The fit is true to size, but the toe box is fairly narrow, so if you are in between sizes, you probably will prefer the larger one. There is padding around the heel collar and a simple thin inner sole. While it may have been nice to see a fancier inner insole, the cushion comes from the midsole, and it works fine. For general mileage and tempo workouts, the hold from the upper is completely stable, and shouldn’t cause any issue. However, I did experience some minor issues at faster paces. When dropping, the pace significantly below 6-minute miles, I noticed minor slippage in the shoe. This issue became particularly apparent when turning or sprinting. On the track, I found that my feet would move in the shoe when rounding corners, even when they were properly tightened. The Beacon was not designed as a racing shoe; thus, the comfort and simplicity of the upper outweigh the lockdown issues. The midsole is what sets the Beacon apart from the rest of the market. The Fresh Foam Ground Contact foam used in the shoe is new for New Balance and is one of my favorite midsole components on the market. While it shares the Fresh Foam name with previous New Balance shoes, it is noticeably a new compound. The Ground Contact foam was designed to be durable enough to serve as both a midsole and an outsole, contributing to its excellent softness. While previous Fresh Foam models felt a little dull and dead, this shoe is both plush and responsive, which is credited to the lack of a full-length outsole. Much like the upper, the midsole is simple. It is comprised of a single density foam, compared to the complex TPU pellets, stiff shanks, and any number of other (often redundant) technologies used in some of its competitors. The standout benefit of this simplicity is that it weighs between one and three ounces less than many of its ‘lightweight’ competitors, while still providing all the necessary features, and soft cushioning. Like other Fresh Foam shoes, New Balance uses hexagonal geometry on the sides of the midsole. This is to adjust how the cushion compresses and to provide slightly more support on the medial side. While it is maybe a touch firmer there, this is not a support shoe by any means, it does not provide enough support for moderate to severe under or over-pronators. Frankly, there's not a whole lot to say here, as New Balance kept it very minimal in the outsole department. The majority of the outsole is comprised of the Ground Contact foam with a few blown rubber pods added on the lateral side in the rear, and towards the medial side in the toe. The rubber pods are strategically placed in the natural landing and toe-off zones to add extra traction where it is necessary. I have found the traction to be fine, as long as you avoid mud or snow, and have even been able to use the shoe on smoother trails in dry weather. The durability has also been surprisingly good considering how little rubber is on the bottom of the shoe. The Ground Contact foam is hardened on the outsole to increase durability. As a forefoot striker, the foam wore down on the forefoot of my pair after more than 300 miles of running, but they are still completely usable. As long as you are not too hard on your shoes, the durability should be fine, and if you are hard on your shoes, this probably isn’t the right shoe anyway! The Beacon was a surprise release and became one of my favorite shoes this year. I generally look for shoes with soft cushioning and low weight, often reaching for Hokas. While I do miss the stiffer shank and meta-rockers seen in Hokas, the Beacon is what I wish the Hoka Clifton became. While the Clifton became heavier and more supportive, the Beacon filled the niche of soft and light shoes that the original Clifton occupied. The Beacon was my go-to road shoe this fall for most of my mileage as well as my longer workouts, such as mile repeats on the road or tempo runs. While I did one road race and a couple of faster workouts (800s on the track) in the Beacons, I would recommend doing these in racing flats or spikes, depending on the surface. While the Beacon is a soft and comfortable shoe, you still may want to rotate it with something heavier and more supportive for recovery runs or long runs over 10-12 miles, especially if you are injury prone. Overall, the Beacon has been one of my favorite shoes recently. I would highly recommend it to anyone looking for a light and cushioned daily trainer or up-tempo shoe. The New Balance Fresh Foam Beacon is a neutral running shoe that’s made for the roads. It’s also meant for a variety of activities like speed training and racing. When it comes to design, it brings a smooth and simple look that’s popular with many contemporary options on the market. Bright colorways make up for the lack of substantial overlays and other add-ons. The upper unit features an engineered knit material. This material brings a lightweight yet secure coverage. It’s also breathable and flexible. A set of synthetic prints bolster the eyelets while the ‘N’ logo graces both sides of the façade. Underfoot cushioning is the responsibility of the Fresh Foam technology. This full-length unit carries the foot throughout the running session. The high-wear points of the outer sole are reinforced by rubber. For durability, the New Balance Beacon makes use of a blown rubber material. The rubber placements are strategically attached to high-wear areas for increased durability. The New Balance Fresh Foam Beacon is available in the usual sizes, and it follows the regular sizing expectations of consumers. The width options are D – Medium and 2E – Wide options for men, and B – Medium and D – Wide for women. The VL-6 Last entails standard measurements in the heel and forefoot. The height of the toe box isn’t too high nor too low. It may satisfy those who have medium foot dimensions. Blown rubber is the material that’s used in the outsole unit of the New Balance Fresh Foam Beacon. It’s only placed in areas that are most prone to wear, specifically the lateral side of the heel and the medial side of the forefoot. Its tasks are to protect against damage and to provide surface traction. The rest of the outsole is comprised of ground-contact foam. The textured surface heightens grip while shallow grooves enable flexibility. The Fresh Foam cushioning unit composes the midsole of the New Balance Fresh Foam Beacon. This full-length material offers a soft and springy ride. And though it looks like it has a substantial thickness, it doesn’t hold a lot of weight. This material is also present in the midsole of the Zante v4 and other popular New Balance running shoes. This midsole foam offers featherweight feel while effectively disperses landing impact. This foam is lighter than the usual midsole foam and it aims to provide long-lasting cushioning throughout the run. The engineered knit upper offers a soft and breathable wrap.This material is also lightweight. It’s capable of bending with the foot, thereby facilitating an in-shoe experience that adapts to the gait cycle. The overlay system is made of synthetic prints that bolster some sections of the upper, namely the eyelets and the sides. These thin add-ons help in maintaining the structural integrity of the façade. The tongue and collar of the New Balance Fresh Foam Beacon are padded. These parts of the shoe are responsible for holding the foot in place and preventing it from wobbling or exiting the foot-chamber accidentally. They also offer additional cushioning for comfort. The shoe has a lace-up closure, which offers the foot a secure, comfortable lockdown. Runners can easily adjust the laces to achieve the right fit. There are extra eyelets to further secure the midfoot.